CHARLOTTE, N.C. — A fight. Four technicals. Three ejections. Two career-high point totals, and nearly a third. And that was just the opening act. Charlotte sophomore guard Jon Davis tallied one of those career-highs, scoring 35 points. None were bigger, though, than the final two, a 16-foot jumper that splashed the net with 0.2 seconds remaining and gave the 49ers a 74–72 victory over Old Dominion before 5,650 fans in Halton Arena Saturday night. “I would have been mad at him if he would have passed,” joked Price. Before that shot ever became an issue, a wild first half unfolded. Old Dominion (11–8, 4–3 C-USA) knocked down six of its first nine three-point tries, building a lead as large as 12 points in the opening stanza. As the half neared its final media timeout, the complexion of the game significantly changed for both teams. A scramble for a loose ball near midcourt resulted in a fracas, resulting in coaches scrambling to separate players, and the officials spending a prolonged period at the monitor reviewing the action. 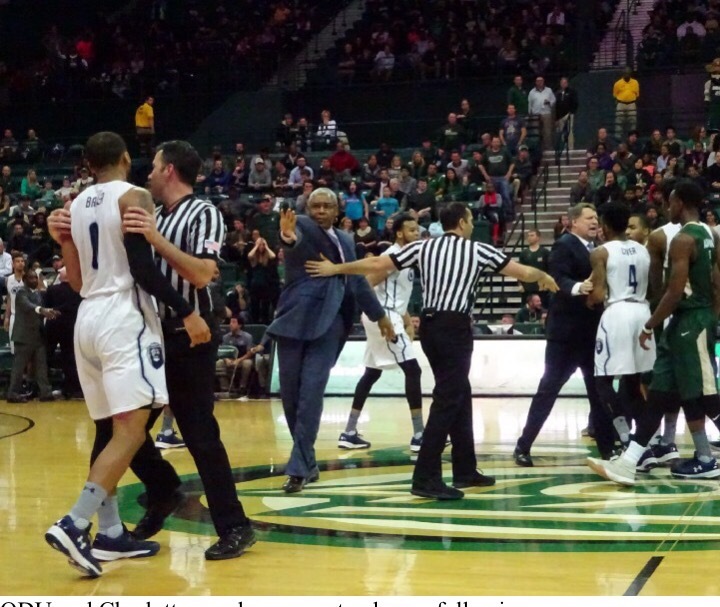 Three players in total were eventually ejected for their roles in the brawl, with Old Dominion guard Jordan Baker getting the gate, while Charlotte forward Anthony Vanhook and guard Andrien White were sent off. Both teams quickly and effectively made those adjustments, settling into a back-and-forth affair in the closing twenty that saw eight ties and 13 lead changes. The pendulum swung on seemingly every possession, with the teams trading baskets until an Ahmad Caver three gave Old Dominion a four-point lead at 52–48 seven minutes into the period. Caver — who nearly accomplished a career-high of his own — gave his side the largest lead either team would enjoy in the second half. The ejections of Vanhook and White forced Charlotte into a considerably smaller lineup, further accentuating the Old Dominion size and rebounding advantages. Baker’s absence, meanwhile, meant that the senior guard could not shadow Davis on the defensive end. The tension continued to build with each ensuing basket, as a Hudson Price jumper gave the 49ers a one-point advantage with 2:16 to play. The scoreboard would stand still until a Zoran Talley free throw drew the Monarchs level with 29 seconds to play. The second attempt would not fall, however, and Charlotte secured the rebound, then called its final timeout, setting the stage for Davis’ heroic finisher. Davis’ 35 paced the 49ers and all scorers. The sophomore knocked down 11-of-19 tries from the field (3-of-6 from three) and 10-of-11 from the line. Redshirt junior Austin Ajukwa added his own career high for Charlotte, scoring 17 points on 6-of-12 shooting. Charlotte converted on 53.8 percent of its tries (14-for-26) in the second half. Caver scored 25 for the Monarchs, nearly equaling his career high of 28. The sophomore guard from Atlanta drilled 5-of-7 three-point tries, adding five rebounds and five assists. Redshirt sophomore forward Zoran Talley recorded a double-double, collecting 16 points and 12 boards. Old Dominion made good on 8-of-14 tries from distance, including six of its first nine. Both teams will depart for Texas to continue conference play. Old Dominion will visit Rice Thursday night for a tilt slated to tip at 8:00 (Eastern). Charlotte will travel to North Texas, with that game also scheduled for an 8:00 jump. The teams will then flip destinations for games next Saturday. OLD DOMINION (11–8, 4–3 C-USA): Porter 3–5 0–0 6, Taylor 0–0 3–4 3, Baker 3–5 0–0 9, Stith 2–11 3–4 7, Caver 8–15 4–5 25, Kah 1–1 0–0 2, Fields 0–0 0–0 0, Haynes 2–4 0–1 4, Pinckney 0–0 0–0 0, Vassor 0–0 0–0 0, Talley 7–17 2–4 16. Totals 26–58 12–18 72. CHARLOTTE (9–9, 3–4): Vanhook 3–5 2–2 8, White 1–6 0–0 2, Davis 11–19 10–11 35, Ajukwa 6–12 4–4 17, Jackson 0–6 0–0 0, Garvin 0–0 4–6 4, Ogbueze 0–5 0–0 0, Price 1–1 0–0 2, Aube 1–1 4–5 6. Totals 23–55 24–28 74. Halftime — Old Dominion 38–35. 3-Point Goals — Old Dominion 8–14 (Baker 3–4, Stith 0–1, Caver 5–7, Haynes 0–1, Talley 0–1), Charlotte 4–16 (White 0–3, Davis 3–6, Ajukwa 1–3, Jackson 0–2, Ogbueze 0–2). Fouled Out — Jackson. 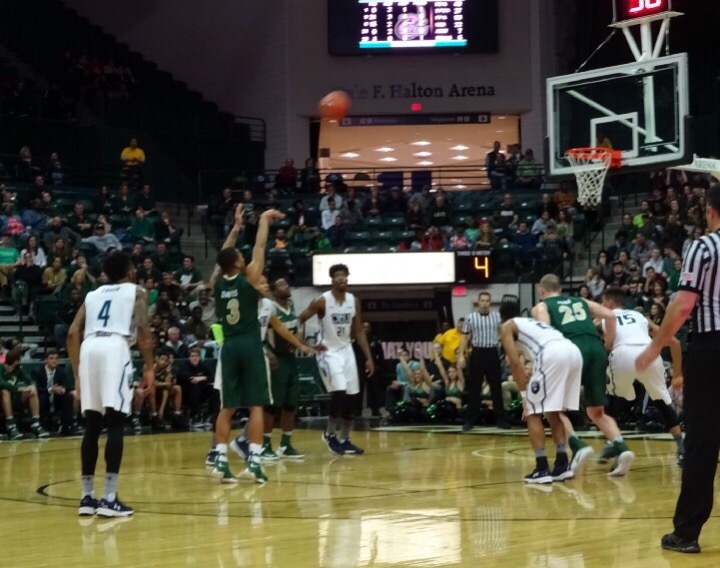 Rebounds — Old Dominion 43 (Talley 12), Charlotte 26 (Garvin 6). Assists — Old Dominion 11 (Caver 5), Charlotte 8 (Davis 5). Total Fouls — Old Dominion 23, Charlotte 18. Technical — Porter, Baker, White, Vanhook. A — 5650. Points in the Paint — Old Dominion 30, Charlotte 28. Points off Turnovers — Charlotte 11, Old Dominion 1. Second-Chance Points — Old Dominion 14, Charlotte 2. Fast Break Points — Charlotte 6, Old Dominion 0. Bench Points — Old Dominion 22, Charlotte 12.